Dedicated to the Vinten Vision blue series of tripod heads, as well as the 3AS and 5AS heads, this Camera Mounting Plate is a spare or replacement item for the plate originally included with the head. Included with the mounting plate are two 3/8" screws, one 1/4" screw, and one 1/4" screw with a pin assembly. Box Dimensions (LxWxH) 5.3 x 2.45 x 1.0"
Camera Mounting Plate for Vision blue Series and 3AS/5AS Heads is rated 4.0 out of 5 by 7. Rated 5 out of 5 by Orb from Money! I needed a replacement for my old fluid head. It is a gorgeous head and I really was not relishing replacing an $800 piece of gear because the idiots I rented it to lost the plate, leaving it on the camera they rented. UGH Anyway, the staff at B&H gave me a curious look when I brought my head in hoping to find a replacement, but we walked around the display models, tried a couple of fits and found the perfect one. I couldn't have done it without their help. The staff was immense in helping. I saved a couple thousand dollars thanks to B&H when other stores weren't even interested in helping. Rated 3 out of 5 by Dan M. from Solid but expen$ive I recently bought a Vinten Visoion Blue, which is a fantastic value for a DSLR shooter. Unfortunately this means I had to buy a couple of these overpriced camera plates, but the good news is that they work great and and are very solid - just a hunk of milled metal that gets the job done - for a hefty price. Unfortunately, if you're using a 1/4 thread, as I do with my DSLR, the screw can fall out easily if you're not careful. Rated 4 out of 5 by Nelson M from Does what it's supposed to do. Bought this for my Vision 3AS head, it's expensive but if you want to work quickly and have something else to go on the tripod head (in my case a camera slider), it's worth the money. Only four stars because of the high price. Rated 5 out of 5 by JAA7 Studios from Camera Mounting Plate The product is self explanatory it keeps my camera DSLR on my tripod. It does a great at that! Well made. Only bad thing is the price...waaaay to over priced but what can you do. Rated 4 out of 5 by Cindi C. from Fits Vinten Vision 5 Replacement plate with multiple #20 screws that fits my older model Vinten Vision 5. Speedy delivery. Crazy expensive, otherwise I would give it 5 stars. Rated 3 out of 5 by Domingo from Reemplazo de la PLACA DE MONTAJE DE LA CMARA VINTEN PRO6VLV Necesito saber si el Manfrotto MN-501PL TRIPOD PLATE es similar en caractersticas y dimensiones al Vinten Pro6PLV? What are the dimensions of the plate? Will this fit an older Vision 3 head? This is listed as the correct plate for the Vinton Vison 3 head. Expected availability: 2-4 weeks. 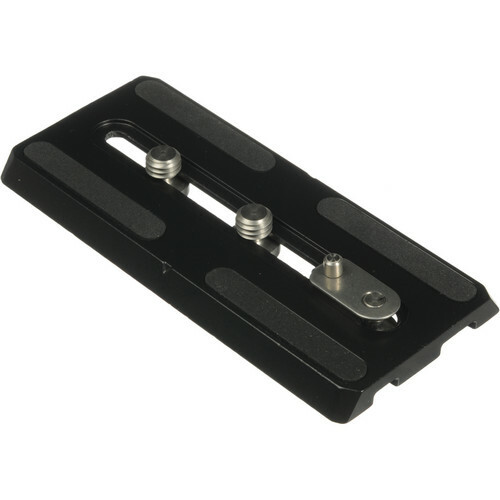 Vinten 3449-900SP Camera Mounting Plate with Two 3/8 -16 Screws - for Vision 3 and Vision 6 Fluid Heads B&amp;H # VI3449900SP. what kind of quck relase paltfom compatible whit this plate? We use it on a Vinten Vision Blue Tripod.